By year-end, Latvia is to publish a trove of KGB (Soviet secret police) files that remained in the country after the collapse of the USSR. The process, known as 'lustration' and similar to that undergone in other countries with a communist past, will conclude with the index cards concerning about 4,300 agents being published, and researchers working with the documents have hinted that many well-known people are on the list. What are the KGB files? Known colloquially as the 'Cheka bags', because they were discovered stashed inside cloth bags, the KGB files are a document trove that was found during the 1991 barricades inside the KGB building on Brīvības street 61 currently housing the Stūra māja KGB museum. According to Latvia's state bulletin, the index (see below for more on its content) spans some 4,300 out of about 25,000 KGB agents active in the period from 1953 to 1991, but it mostly concerns agents active in the late 1980s. It's clear that the archive is incomplete, which is perhaps elucidated by the fact that, for days, black smoke rose from the chimneys of the KGB building before it was overtaken by pro-independence forces. KGB agents did intelligence and counterintelligence work, like reporting to their superiors about the prevailing winds across the intelligentsia. They were helped by "trusted persons" of the local populace, and it is thought there might have been thrice as many of these "trusted persons" as the actual agents. However, the cards do not reveal whether the person actively collaborated with the KGB; and though they establish the fact of collaboration, it does not reveal the exact circumstances of recruitment, namely whether the collaboration was volitional. In addition to agents proper, the index also includes info on coordinating (non-field) agents and holders of "conspiratory apartments" where KGB agents lived undercover. Why are they being published now? In 2018, following repeated but unsuccessful attempts to publish the documents in the 1990s and the early 2000s, the 12th Saeima in its last sitting confirmed that the Cheka files are to be published by year-end. This has always been a matter of political will and may or may not be related to the centenary of the Latvian state, or a 2015 initiative when dissident Lidija Doroņina-Lasmane was celebrating her 90th birthday, and on the occasion she and a number of public figures called for publishing the files. The Latvian National Archives, tasked with publishing the documents, says it publish them with the goal of "informing the public about the totalitarian regime that ruled Latvia during the occupation, the total social control and the mechanisms and instruments employed by this regime, as well as promote the public ability to identify the consequences of this regime, overcome them and continue developing Latvia as a democratic state." Where and how will they be published? After work by a committee tasked to evaluate the documents, they have now been handed to the Latvian National Archives, which will publish the files online before this year's Christmas. The archive will publish the raw, digitized index files without historical commentary, according to Gints Zelmenis (link in Latvian), a researcher at the archives. In order to view the documents, registration via email address will be required on the Latvian National Archives website. However, the full contents of the whole archive will not be available immediately. 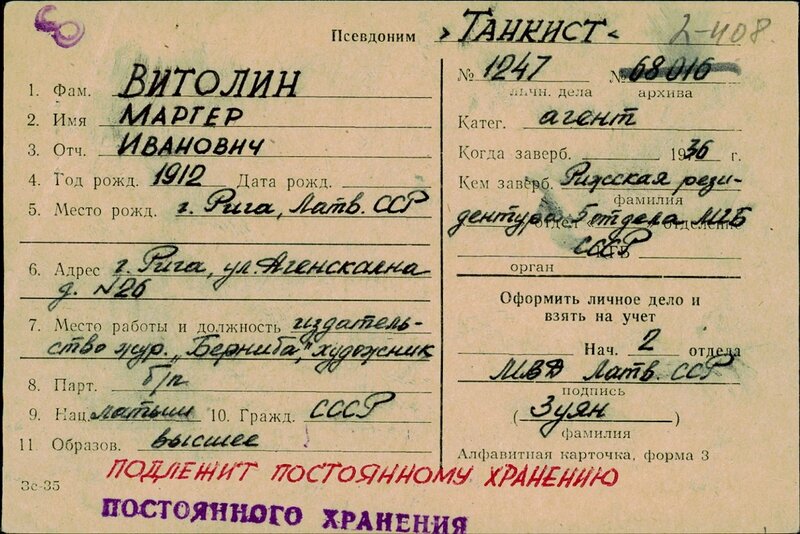 Initially only the KGB's typed "agent cards", the KGB telephone directory and official documents giving details of various administrative and procedural methods will be viewable. The director of the Latvian National Archives has said that people might be disappointed that everything was not immediately available and searchable - with precise searches likely to be available only next May and before then further approval is required from the incoming government. Other KGB files are to be published afterwards. The bill stipulates that files about third parties and victims will not be published but will be available for research. According to Andris Pauls-Pāvuls, an early Latvian MP who had access to the Cheka files, 36 out of 138 Higher Council MPs who voted for reinstating Latvia's independence were KGB agents, though their names are not known to the public, yet. Just a few people have publicly acknowledged that they were KGB agents, including Ivars Lācis, former rector at University of Latvia, orientalist professor Leons Taivans, as well as poet Jānis Rokpelnis. They said they did not report on other people and that collaboration was the only way they could have a career. During the 5th Saeima, Foreign Minister Georgs Andrejevs stepped down after confirming accusations that he had been a KGB agent. Pointedly, the documentary Lustrum, which premiered in November, relates the circumstances in which people were approached by the KGB to become part of the restrictive apparatus.